The Red Sea line of additives is one of our most popular lines. Red Sea has done testing to see what elements corals take up in what ratios. They then developed an entire system to keep your reef tank from being depleted of any single element, while giving your corals great health and vibrant coloration. Provides the 31 minor and trace elements required by corals in 4 - 100 mL bottles. 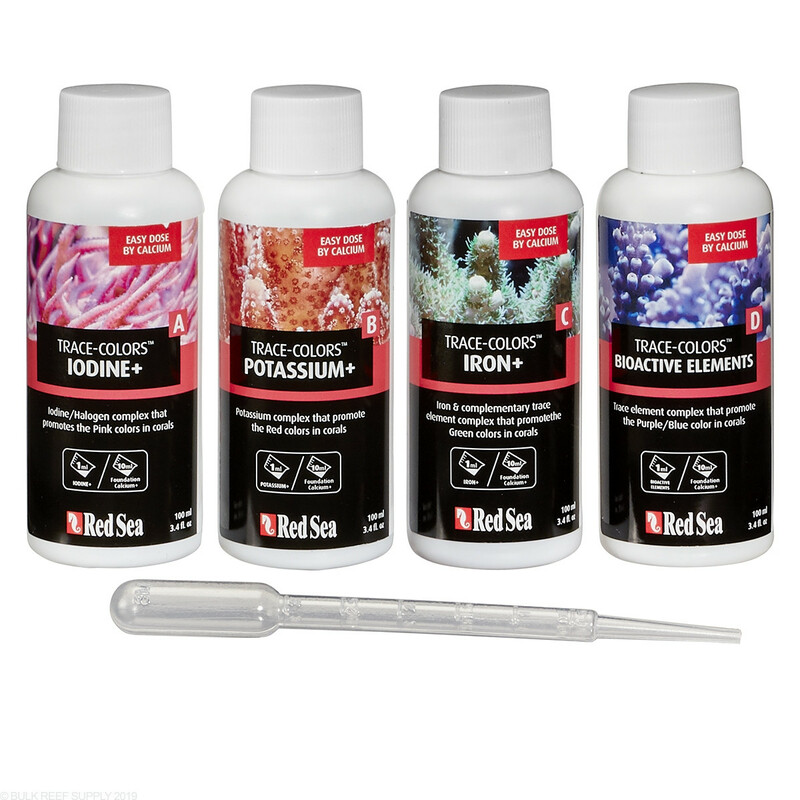 Red Sea Trace Colors A contains an Iodine and Halogen complex to help promote the pink colors in corals. 1 mL will raise the iodine level of 25 gallons (100 liters) by 0.03 ppm. 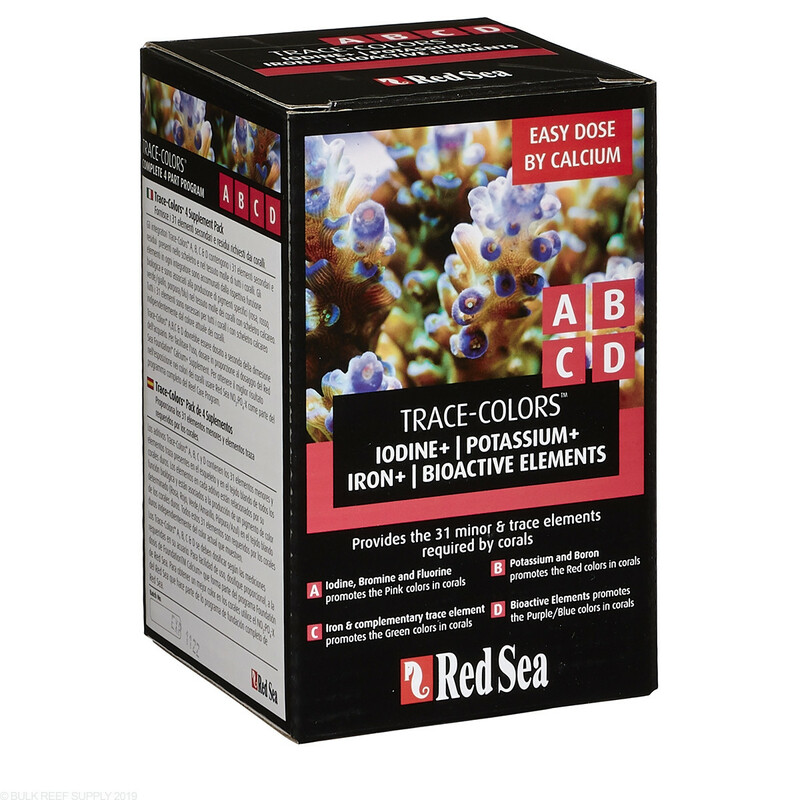 Red Sea Trace Colors C contains iron and complementary trace element complex to help promote the green colors in corals. 1 mL will raise the Iron level of 25 gallons (100 liters) by 0.02ppm. 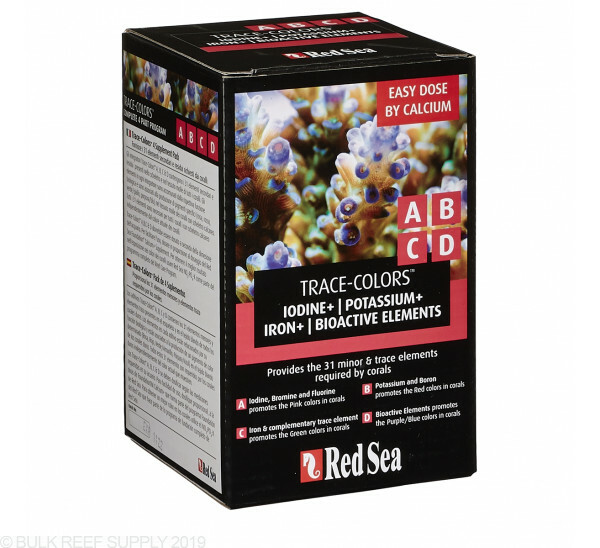 Red Sea Trace Colors D contains trace element complex to help promote the purple/blue colors in corals. I dosed this once and plan to dose once per week. Upon first dose and Alk increase I have corals PE and deeper coloration. Also some look healthier and are growing. I have a mixed reef biocube 32 LED, a little over a year old now. I've also experienced better growth when using this product. started adding per their instructions and it started to kill my corals that ive had 4+ months nothing else in the tank was changed. same exact maintenance schedule. DO NOT USE THIS STUFF! Works as intended. I noticed a big difference after two weeks. Much more vibrant and healthy Coral. The product works as described to enhance coral colors. I've never been disappointed by a Red Sea product but I have yet to use this particular box I ordered from BRS because, while it did arrive a day early, one of the bottles had leaked through the box. I got on the phone to BRS and after only waiting for about a minute to talk to someone, the representative apologized for the inconvenience and shipped a whole new box to me. I have only ever dealt with this caliber of customer service at a certain online shoe retailer (starts with a "Z") and I have only bought shoes from them since. Now I will only be buying my reef supplies from BRS. Thanks for putting the customer first, guys! This product really works bringing the colors to yours corals. Quick update on my 3/27/16 post. The third day after I resumed dosing (I dosed the entire weeks worth on a monday), I again already noticed a deepening color and I swear, better PE!! Don't spend money on Acropower, buy this!! Sps dominated tank, colors a bit light and pale. Can't believe it, but colors deepened and intensified. I stopped using just to make sure I wasn't experiencing placebo. It's been three weeks and colors are again lightning, fading, and pailing. This stuff actually works! This product markets itself for colorization, but I was pleasantly surprised to see immediate growth. All my sps grew white tips within 24 hours! Once the growth spurt was over, the tips gave colors I'd never seen before. However, I'd advise to use a little less than recommend to start. Very impressed. To early to tell. So far it has made my green pop. I started with 1/4 the dose. I am trying the pink next. So far so good. It's worth trying it. When I first started using this, it actually made the corals retreat and be unhappy for a bit. So I stopped using it and did a water change. Once I learned that for my tank I need to do the dosing in the sump and not the display tank then things started to take off. I have been using for about 1.5 weeks and I can definitely see improved coloration. I am under dosing on purpose just to be on the safe side, but I can definitely see where this is doing exactly what it is supposed to be doing. Do I need to refrigerate Red Sea Colors after opening? You will not need to refrigerate the coral colors after opening. Feel free to let us know if you have any further questions! I am using BRS 2 part in my 130-gallon system. I would like to know how much of Red Sea color should I use in my tank.How do I dose this product? Going by Red Sea's simplified instructions, they recommend 1mL of each supplement per 25 gallons for every 20ppm of calcium that your system consumes. Typically this should be dosed daily. How / can you use this with dosing kalkwasser? You can use with Kalkwasser. It is a good idea to test for these trace element with the appropriate test kit. Feel free to let us know if you have any further questions! Would using Coral Colors with Reef Energy A & B be overkill or overlap the elements being dosed? The Red Sea Reef Energy and Coral Colors packs are actually designed to be complementary. 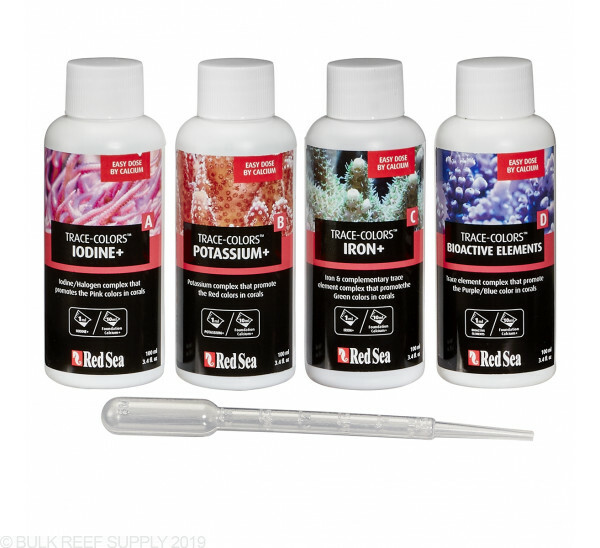 The Reef Energy provides a concentration source of carbohydrates and amino acids, while the Coral Colors pack addresses a number of important minor and trace elements that help corals color up their best. Several of us here use both of these sets of products on our tanks with great results! I was wondering if all the bottles can be combined into one to have set up to a dosing pump? Right now I only have 1 open pump on my JB-4 and this would be ideal if they can be stored together in a single container. The bottles unfortunately cannot be combined together as the elements will fall out of solution and not work for the system. These need to be added separately. I am using BRS 2 part and dosing daily, can i keep dosing those along with the colors? or colors only? 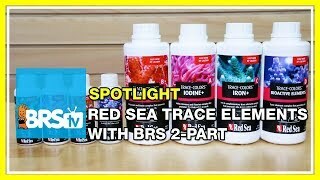 The Red Sea Coral colors are a great complement to our BRS 2 part. They provide many of the necessary trace elements that corals will consume and 2 part does not replace. Many of us here at the office use the RS Coral Colors and Reef Energy A/B along with our 2 part and get great color and growth!